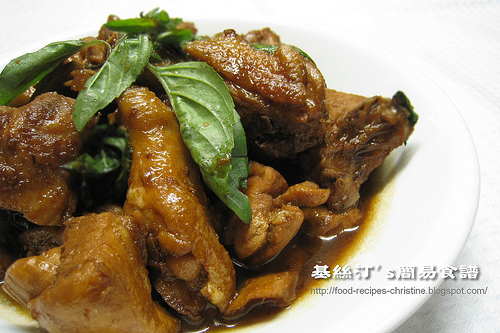 Three Cup Chicken is a very popular and tasty Taiwanese dish that you'll definitely find at any Taiwanese restaurants. To make this dish at home, it's downright simple and easy. After moving to Australia, I’ve been very lucky to have many chances to try some Taiwanese foods because many Taiwanese run their gorgeous restaurants here. Nearly all the Taiwanese restaurants would have one of their famous dishes called “Three Cup Chicken” (三杯雞) on their menus. At first, the name of the dish caught my sight and aroused my curiosity. “Three cups”? Ha, interesting! What is the "three cup sauce"? Many of my Taiwanese friends know this dish of course. Again, I was lucky enough to get the recipe and tried it at home. “Three cup sauce” actually includes rice wine, sesame oil and soy sauce in the proportion of 1:1:1 Adding basil into the stewed chicken is a must and make this dish very unique in taste and smell. The sauce is perfectly balanced and the basil makes the chicken irresistible. Similar to what people say, “Love at first sight”, yet I fell in “love at first taste”. Rinse and drain chicken, then cut into chunks. Heat 2 tablespoon oil to sauté ginger, garlic and shallots until fragrant. Add in chicken chunks and continue to sauté. When the chicken turns white in color, pour in the sauce ingredients and cook on high heat, bring it to boil. Cover with a lid, lower heat. Cook ingredients for about 30 to 40 minutes till tender and done. When sauce begins to thicken, turn off the heat and add basil. Stir well. Dish up to serve. Rock sugar is pure sugar cane in lumps, available at Asian grocers. Or you can order from Amazon. It will work like a charm balancing all the flavours of soy sauce and make the sauce look a bit glossy. How big is the ginger? Just a bit, about 15 to 20gm. That's enough. I surfed onto your website when I was looking for a recipe for three cups chicken. I am Chinese-American and your recipes remind me of home! My chinese cooking was very mediocre before I surfed onto this site. Thank you for sharing these recipes! I make Three Cups Chicken all the time now, it's especially a hit when people come over for sunday evening dinner. Looking forward to trying everything on this site. Thanks again! Glad that you found my site. Thanks for your kind words. My family loves Three Cups Chicken very much. Once in a while, I'll cook this dish for them. You know, the basil makes this dish so tempting. Can't resit it. Welcome to come back again. I'll continue to share what we like to eat and cook. Hi Christine, thank you for your wonderful recipes.. quick question though.. we dont have Taiwanese basil here, can I use Thai basil for this recipe as a substitute? Sure, you can use any basil you like as long as you desire. Once I used the sweet basil not the Taiwanese basil and my family loved it too. how can i find out your delicious recipe? its loooooks so nice, i am ur big fan..but i wonder, how we can substitute rice wine ? The rice wine is the must-add-ingredient esp. for this dish. I don't think you can substitute it. Sorry. You're welcome. Glad that you liked this recipe. The dish is quite flexible, I can say, any kinds of basil and rice wine work really well too. Was a bit reluctant to try at first , but I have not regret a bit .I taste wonderful . Will keep making for more often now on. So glad that you love my recipes and they can help you. Thanks so much for letting me know. Thanks for sharing the recipes. Just taste it in Taiwan, good !!! Is cooking rice wine referring to Shaoxing wine (yellow wine), or the Chinese (white) rice wine? Do they make a difference at all? Thanks! This is my first visit, and your recipe list is like a restaurant menu that I can make at home - I have marked so many of them now! Impressive! Yes, I often use and prefer Shaoxing wine when making Chinese stir fry dishes. Shaoxing wine has a stronger taste and flavour. But you can use white rice wine instead if you like. Hi Christine, I have an Instant Pot, can u cook the dish with it to save some time? Sure, you can use Instant Pot to make this dish. Feel free to experiment and figure out the optimal cooking time.